Many times people ask, “If aliens are here, why don’t they land on the White House lawn?” Well, you may be surprised to know, in 1952, Washington, D.C. was buzzed by UFOs. Jets were scrambled, but, according to the jet pilots, they could not catch the mysterious objects. These UFO incursions took place on several occasions, and on one of them, U.S. Air Force UFO investigators were prepared to observe the whole affair. Sure enough, they witnessed one of these events from the control tower at Washington National Airport. Perhaps the most thorough examination into the UFO issue was conducted by the U.S Air Force. They began their investigation in 1948. It was called Project Sign, then its name was changed to Project Grudge, and finally changed once again to Project Blue Book. However, upon closer examination of the thousands of files released regarding the Blue Book investigations, it becomes apparent that the Air Force’s conclusions were not shared by everyone involved in the investigation, and that there were some truly fascinating cases that remain unsolved. 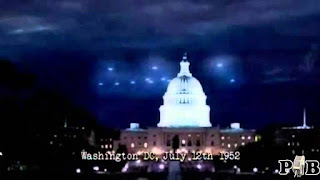 UFO sightings over Washington, D.C. in July 1952 made worldwide headlines and left the Air Force dazed and confused, according to the head of Project Blue Book at the time. The events spanned several days and included multiple radar identifications of unknown aircraft, some of which were correlated by witnesses on the ground. Many of the sightings caused the Air Force to scramble jet fighters, and in each of these cases, the UFOs outmaneuvered the jets. This all culminated into what may be the most important official Air Force UFO investigation of all time. The investigation of the events in Washington, D.C. is best explained in a book written by the lead Air Force investigator, Captain Edward Ruppelt, the head of Project Blue Book from its inception in early 1952 until late 1953. The summer of 1952 was a busy time for Blue Book investigators. Ruppelt referred to this period as “The Big Flap.” Some of the most credible reports were coming from the Washington, D.C. area. Ruppelt immediately called his superior officer at the Pentagon and was briefed on the incident later that day at Bolling Air Force Base. At 11:40 p.m. the previous night, seven objects were caught on radar at Washington National Airport. At first, the radar operators thought the objects were a formation of planes, but nothing like that was scheduled. The objects moved slowly at about 100 to 130 miles per hour, but then would streak across the scope in sudden bursts of speed. The targets had moved all over the area, including over prohibited areas, such as the airspace above the White House and the U.S. Capitol building. One of the objects was clocked at speeds of more than 7,000 miles per hour. One week later, it happened again. However, this time the Air Force was ready. As soon as reports began coming in, several people from the Pentagon hurried out to Washington National Airport. At about 10:30 p.m., Washington National Airport had once again picked up the slow-moving targets. The objects were in an arc surrounding the Washington, D.C. area. The same radar operators were present from the prior event, so they were prepared and worked quickly to track the UFOs. They contacted Andrews Air Force Base who confirmed they were also tracking the objects. At 11:30 p.m., it was decided to call in interceptors to check out the objects. Two Lockheed F-94 Starfires were in the air by midnight. At this point, reporters and photographers were asked to leave the radar room. Ruppelt says the radar room was cleared because some Air Force officers thought this might be the night they would get a good up-close look at a UFO. I tried to make contact with the bogies below 1,000 feet, but [the radar controllers] vectored us around. I saw several bright lights. I was at my maximum speed, but even then I had no closing speed. I ceased chasing them because I saw no chance of overtaking them. I was vectored into new objects. Later, I chased a single bright light which I estimated about 10 miles away. I lost visual contact with it about 2 miles. The papers were once again packed with headlines about the UFO chase. Ruppelt flew to Washington and when he got to his hotel, was mobbed by reporters and photographers. According to Ruppelt, the Air Force was in a state of confusion. Unable to dodge the public’s fascination with the Washington events, on July 29, Major-General John Samford notified the press that he would have a press conference on the Washington UFO incidents. Ruppelt felt it a bit odd that none of the men in the radar room at Washington National Airport were involved in the press conference. Instead, the press conference was held by Major General Samford and another officer, neither of whom had been fully briefed. He said the Air Force would continue to investigate those reports, but they suspected that the Washington, D.C. events may have been false radar readings due to temperature inversions. According to Ruppelt, the actual investigation ruled out temperature inversions. Alleged pictures and videos of this event can be found on the internet (photo on left). However, they are all either reflections or recreations of the incidents. No pictures or video were actually captured. However, the case remains unsolved. Ruppelt said this case convinced many in the Air Force that UFOs were interplanetary spaceships.